Meet Wiwi the Kiwi. 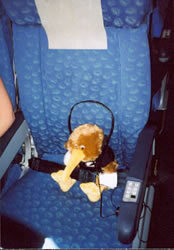 Wiwi has left a small country town in New Zealand, for a Big OE, and is now living with friends in Dublin, Ireland. Wiwi loves to travel, loves meeting new people, and visiting new places with friends. You can meet Wiwi now, relaxing on the jet as it zooms over Europe for a touchdown in Istanbul, Turkey. The trip has been planned, the money saved, the tickets bought, the bags are packed, and and the passport checked. In this adventure, Wiwi is going to Gallipoli with three friends, Hayley, Bruce, and Karalee. Put on your walking shoes, fold the map, get your water bottle filled, organise your day pack, and become a tourist in Turkey for a few days with Wiwi the Kiwi. Hi everyone - I'm Wiwi. You may already know that people from New Zealand are often called Kiwis. I'm on my big OE, and I live with four great people in Dublin, the capital city of Ireland. We save as much money as we can so we can go on trips during our long weekends and holidays. I'm going with Hayley, Bruce and Karalee this time. Dave has to stay home and work. I'm really excited, and scared. I always feel like this when I'm about to do something new or different. I already know a lot about April 25. I can remember being a very young kiwi, and an old man would come to my school and talk about ANZAC Day, and we would all be wearing a poppy, and we would have a special school assembly, and a flag would be flying, and someone would play The Last Post on a cornet. I can remember standing in the main street of our little country town on ANZAC morning, and watching the old men as they proudly marched along the main street towards the cenotaph. I can remember all the names on the cenotaph being read out. I can remember my teacher taking me on the next school day to see the flowers and poppies that were left around the cenotaph. I'm going to visit the place where ANZAC started.